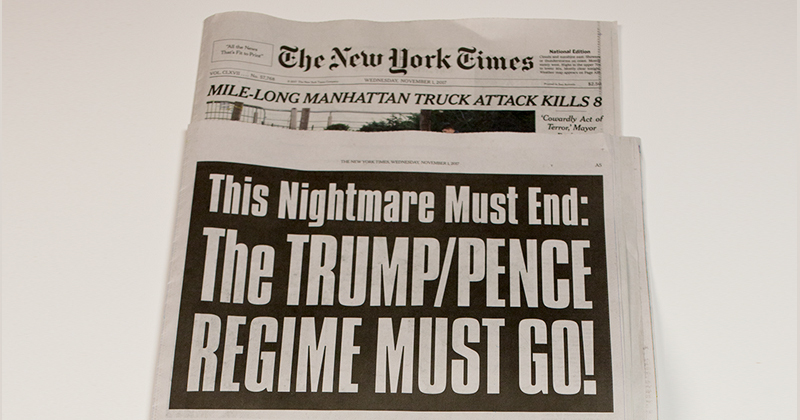 The New York Times published a full-page ad calling for a “revolution” to overthrow President Trump on Nov. 4. It’s ironic how the Times, which operates under the press protections guaranteed by the First Amendment, sold ad space to a group which bragged about denying First Amendment rights to a journalist. The Times was already under fire for its bias against the Trump administration as revealed by a series of sting videos produced by Project Veritas, which caught the newspaper’s editors discussing how they help set up the media’s anti-Trump narrative. “I think that one of the things that maybe journalists were thinking about is, like, ‘Oh, if we write about [Trump], about how, like, insanely crazy he is and how ludicrous his policies are, then maybe people will read about it and be, like, ‘Oh, wow, like, we shouldn’t vote for him,’’” the Times’ homepage editor Desiree Shoe said on hidden camera. The attitudes of the Times’ staff, combined with the Refuse Fascism ad, underscore how the establishment newspaper is not as “professionally neutral” as it claims to be.